Posted on September 12, 2017 by Greg Kaz. Nobody wants to deal with the hassle that comes from getting their motorhome’s roof repaired. However, unless you treat your vehicle right, it could easily be a part of your future. The way to avoid this is by ensuring you do simple things that make it less likely the roof will end up with problems to begin with. We’ll go over a few of those here so you can implement them with your own RV. Something that most people do not do, but that they should do, is go over their owner’s manual. You need to be aware of the specifications of your vehicle, especially when related to how much weight it can carry. Carrying more weight than suggested can do damage to your roof. This applies even when below the maximum load if the weight is kept up for a long amount of time. When driving your RV, you may not be aware of how much abuse it takes. Things like harsh weather, tree sap, and debris are often taking a toll on the roof of your motorhome. Therefore, it’s important to be sure you keep an eye on what is happening, so you can take care of it as quickly as possible. 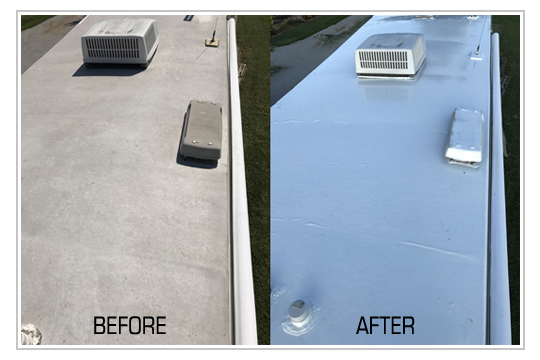 A quick application of RV roof repair for a small blemish is better than having to do intensive repairs. A good rule of thumb is to inspect the roof of your motorhome every three or four months. If the RV is kept under trees for prolonged periods, you may want to check even more often. You don’t want to see a buildup of leaves, algae, or mold as those can lead to more problems. When you do the inspection, make sure to go over the seams well and look for any problem areas. You should also inspect inside the RV at the same time. This applies even if you see no problems on the outside. You may find water stains on the inside that wouldn’t be seen outside. Check the tops of walls as water is often seen there first, when it is still possible to take care of easily. While you’re taking the time to inspect the roof, it’s also an excellent time to clean off the roof, as well. You may find a problem that is forming but would not be visible without cleaning. Of course, you should ensure that whatever cleaning solution you use is appropriate for your roof or the liquid roofing sealant you use. Even if you do everything correctly, problems can still crop up. The good thing is that if the problem is a leak, you can usually handle that on your own using RV roofing materials. However, the problem will get worse if you let it go so deal with it when it comes up. Have some liquid roof on hand for the time when it’s needed so more expensive, professional measures are not required. Posted on August 7, 2017 by Greg Kaz. 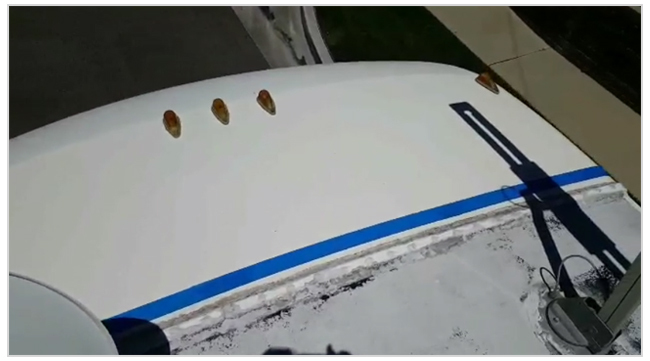 No matter how well you keep your RV maintained and no matter how often you inspect it, problems always seem to happen. If you’ve noticed leaking in your roof, you need to stop it in its tracks before it gets worst. However, if you want to save some money and do the repairs yourself, that’s entirely possible. You simply need to know what materials are needed and how to use them once you have them in your custody. There are quite a few tools and materials that can come in handy for roof repair, but many of them are easy to find and some you may already own. While there are many jobs that may need taken care of, the same tools will work for most of them, so you can minimize some of your expenses. 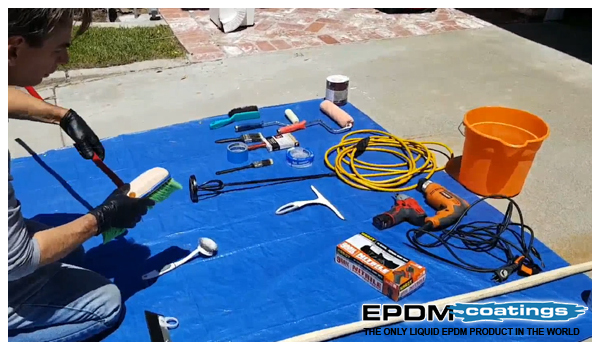 The first set of tools that will come in handy are cleaning tools. You can’t repair a roof without cleaning it off and seeing what is going on. Because of that, it’s a good idea to have some sponges, wire brushes, scouring pads, and other things around. Once you have those, you want to clean the roof off as best you can. All the dirt and debris needs to go, as do any loose pieces of rust or other things. Make sure you get the roof as clean as possible before you move forward with your repair. It will be worth it, even if it might seem time-consuming and frustrating while doing it. Okay, so you have completed the cleaning and you’re ready to bust out what you need to do the repairs. If you’re going to be putting on a patch, you need patching material. If you’re replacing a vent or adding caulking, you need the proper materials to do so. As this can vary, consider what you need to do and what will do it in the easiest way. It can also help to make a list of items you might need for other repairs so you can have them on hand when the time comes. After you have what you need, you can go ahead and complete any needed repairs. Make sure everything you need to complete is done, as the next step is a big one! 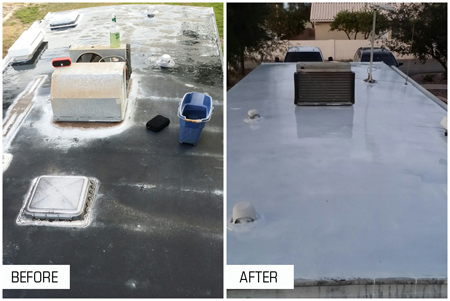 After you’re done with all of that, your next task is to coat the roof with RV liquid roof. This is an excellent product that puts a barrier on your roof that keeps it safe from all sorts of things. This will give you the assurance that you won’t get leaks, which is important for many RV owners. The great thing is that applying it is simple and anyone can do it. To apply, follow the instructions. You’ll need a stirring stick, and a roller is a good idea, as well. You apply the material just like paint, so you may need some brushes as well. Once you’ve coated the entire roof, you’re good to go. No more worrying about repairs for a good long time!